If you shoot video as I do, using a pro camera, you already know what a pain it is to find a bag for your rig that doesn't require you to disassemble the entire thing to put it away. My friends at Think Tank have just released a set of bags that may just be perfect for you. In addition to being lighter weight and having more features than traditional hard cases, the Video Rig Rollers enable you to hit the ground running by leaving your camera rigs fully assembled between shoots. For traveling videographers, the Video Transport Rollers allow you to carry on the maximum amount of gear on the plane with you. Finally, designed for everyday use, the three new Video Workhorse shoulder bags are your on-the-go toolbox for professional video. Don’t forget that with my special arrangement with Think Tank you receive a free accessory and free shipping with your orders of all of their gear. I've posted the press release below, and if you like what you see, please consider supporting me when you purchase by doing so through my link right here. SANTA ROSA, CALIFORNIA – For videographers seeking reduced weight, increased capacity, more features, and ease of use, Think Tank has released seven incredibly strong soft-sided video cases. In addition to being lighter weight and having more features than traditional hard cases, Think Tank’s new video cases let videographers to hit the ground running by allowing them to leave their cameras fully assembled between shoots. No longer will they need to build-out their cameras while the client impatiently waits or the shot disappears. recorder, additional accessories, and up to a 17” laptop in a padded sleeve. The smallest, the Video Workhorse 19 shoulder bag, holds a professional camcorder or video cameras up to 19” and features striated aluminum and arched twinwall reinforced struts to create a collapse-proof lid. Built tough, with the quality Think Tank is known for, these bags are the perfect blend of protection and functionality. · Video Rig 24―Holds a fully or partially assembled video camera rig up to 24” (61cm), which could include camera body, lens, monitor, viewfinder, 4K recorder, audio recorder, rails, follow-focus, matte-box, shoulder mount, top handle, stabilizer handles, shotgun mic, and counter-weight. The case fits a Canon C-series, Sony FS700, FS5, FS7, F5 or F55, Red Epic/Scarlet, Black Magic Cinema Camera, Ursa or Ursa Mini, Aja Cion, Arri Alexa, as well as many ENG cameras. · Video Rig 18―Fits a fully or partially assembled video camera rig up to 18” (45.7cm), which could include camera body, lens, monitor, viewfinder, 4K recorder, audio recorder, rails, follow-focus, matte-box, shoulder mount, top handle, stabilizer handles, shotgun mic, and counter-weight. The case fits a Canon C-series, Sony FS700, FS5, FS7, F5 or F55, Red Epic/Scarlet, Black Magic Cinema Camera, Ursa or Ursa Mini, Aja Cion, as well as many ENG cameras. · Video Transport 20―Holds a video camera body, four to six lenses (detached), shotgun mic, small monitor, 4K recorder, audio recorder, additional accessories, and up to a 17” laptop in a padded sleeve. The roller bag fits a Canon C-series, Sony FS700, FS5, FS7, F55 or F56, Red Epic/Scarlet, Black Magic Cinema Camera, Ursa or Ursa Mini. · Video Transport 18―Fits a video camera body, three to five lenses (detached), shotgun mic, small monitor, 4K recorder, audio recorder, additional accessories, and up to a 15” laptop in a padded sleeve. The roller bag holds a Canon C-series, Sony FS700, FS5, FS7, F55 or F56, Red Epic/Scarlet, Black Magic Cinema Camera, Ursa or Ursa Mini. · Video Workhorse 25―Holds professional camcorders or video camera rigs up to 25” (63.5cm) long and 9.1” (23cm) tall, which could include a camera body, lens, monitor, viewfinder, 4K recorder, audio recorder, medium LED lightpanel, shotgun mic, lavaliere mics, rails, follow-focus, matte-box, shoulder mount, top handle, and cables. The shoulder bag holds a Canon C-series, Sony FS700, FS5, FS7, F5 or F55, Red Epic/Scarlet, Black Magic Cinema Camera, Ursa or Ursa Mini, or a DSLR/Mirrorless rig such as the Sony a7sII, Panasonic GH4, or Canon 5DMIII. · Video Workhorse 21―Fits a professional camcorder or video camera rig up to 21” (53.3cm) long and 8.7” (22cm) tall, which could include a camera body, lens, monitor, viewfinder, 4K recorder, audio recorder, medium LED lightpanel, shotgun mic, lavaliere mics, rails, follow-focus, matte-box, shoulder mount, top handle, and cables. The shoulder bag holds a Canon C-series, Sony FS700, FS5, FS7, F5 or F55, Red Epic/Scarlet, Black Magic Cinema Camera, Ursa or Ursa Mini, or a DSLR/Mirrorless rig such as the Sony a7sII, Panasonic GH4, or Canon 5DMIII. · Video Workhorse 19―Holds a professional camcorder or video camera rig up to 19” (48.3cm) long and 7.5” (19cm) tall and accessories, which could include a camera body, lens, monitor, viewfinder, 4K recorder, audio recorder, medium LED lightpanel, shotgun mic, lavaliere mics, rails, follow-focus, matte-box, shoulder mount, top handle, and cables. The shoulder bag fits a Panasonic PX270, X1000 or DVX-200, Canon C-series, Sony FS700, FS5, FS7, F5 or F55, Red Epic/Scarlet, Black Magic Cinema Camera, Ursa or Ursa Mini, or a DSLR/Mirrorless rig such as the Sony a7sII, Panasonic GH4, or Canon 5DMIII. 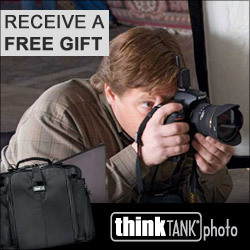 Headquartered in Santa Rosa, California, Think Tank (www.thinktankphoto.com) is a group of designers focused on studying how people work, and developing inventive new carrying solutions that meet their needs. They are dedicated to using only the highest quality materials and design principles, and employing materials that are environmentally sustainable. Should you buy a drone from DJI?